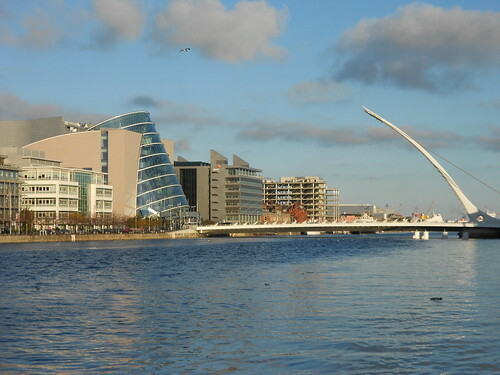 A couple of weeks ago, Natalie and I flew over to Dublin for a bit of a weekend break. We haven’t been away anywhere for a while, and we have fond memories of when we last travelled to the city some fifteen years ago, so we were looking forward to seeing how the place had fared. The answer, unfortunately, seems to be ‘not very well’. While Ireland’s capital grew quickly during the boom years of the ‘celtic tiger’, the recent downturn has most definitely taken its toll. On the city and on its people. I should perhaps mention that my view of the city may have been influenced a little by my holiday reading. I often read in magazines about people who take ‘themed’ reading with them on their travels, so had bought a copy of James Joyce’s ‘Dubliners’, on the grounds that it sounded fairly relevant to our trip. However, I forgot to take it with me, so popped into a bookshop on my arrival and bought a copy of Fintan O’Toole’s book ‘Enough is Enough’, which chronicles briefly the history of the crisis that Ireland has pretty much leapt into head first and sets out what O’Toole (who is, according to the book’s blurb, a well-known commentator and newspaper columnist) thinks the country should do to sort itself out. It’s clear that the city has spent a lot of money on infrastructure in the last decade or so. 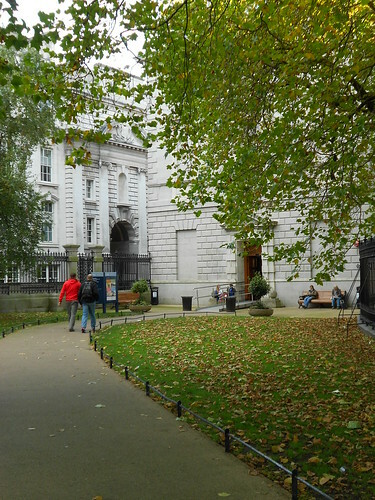 There are some lovely paths along the banks of the River Liffey, complete with trees, sculptures and some very decorative lamp posts. There are also a number of new-looking bridges and a vast array of shiny office blocks, most of which seem to be a little on the empty side. We even found a brand new shopping centre with about twenty empty units and one solitary little Starbucks quietly doing its thing in the far corner. Here’s a view down the river. 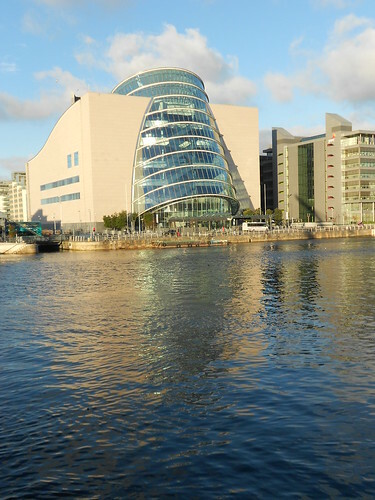 Note the cool harp-shaped Samuel Beckett Bridge and the rather wonky building with the cylindrical glass window thing. 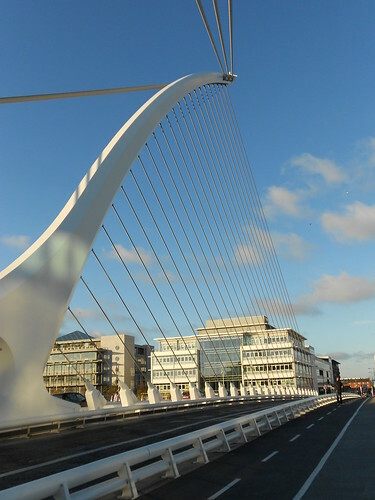 The Samuel Beckett Bridge may also be slightly more artistic than is strictly necessary, but I guess we can cut the city a little more slack here, given that it (a) serves a useful purpose, (b) has a suitably Irish theme and (c) looks unbelievably cool. Although having just looked it up on Wikipedia, I see that there is criticism that it (a) is in the wrong place from a traffic point of view and (b) only lets you turn in certain directions, forcing many drivers to use a nearby toll bridge instead (hmm, sneaky). And it did cost 60 million Euro, which seems quite a lot. Anyway, here’s a picture of the bridge up close and personal. It really does look very nice. Now, I’m sorry if my description of our little city break is less than upbeat. But in my defence, I’m just telling it like it is. Dublin is not doing too well. 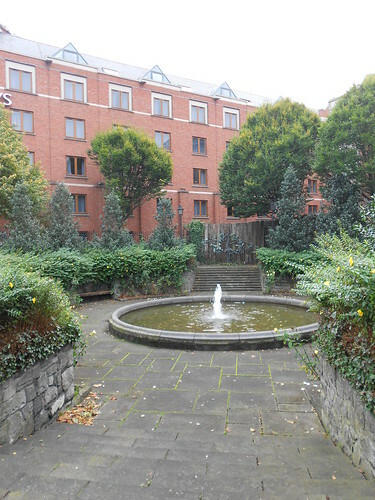 I was shocked not only by the empty buildings, the poor state of public services and the large number of homeless people begging in the streets (as well as the parlous state of the museums), but also by the downbeat nature of the people of Dublin themselves. The city seems to have lost completely the fizz that once made it such an attractive destination. It’s as if Dubliners have become so overwhelmed by their fall from grace that they can’t even imagine a way out, let alone find their way towards it. A little melodramatic, perhaps, but that’s honestly how it felt. There were some good bits, though. I’ll explore some of these in my next couple of posts (this is part one of, probably, three), but I have to mention now the fantastic little gardens that seemed to pop up when we least expected them, such as this tiny one in the gap between two buildings. Check out in particular the sculpture at the back. Here it is closer up. 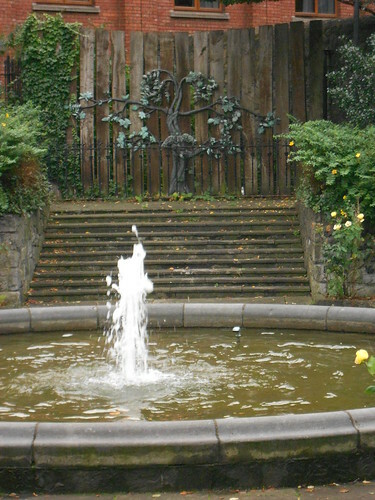 Admittedly, the gate to the garden was locked, so I’m not sure who is supposed to enjoy this little area of tranquility in the heart of the city, but it sure was pretty (if inaccessible). Lest you think that our mini-break was a bit of a disaster, let me assure you that we did, in fact, have a great time. Natalie and I very rarely get any time together that isn’t taken up with work, family or household issues, so it was brilliant to have some time away and to just wander around chatting away to each other. To reconnect. To find the balance that is so easily lost amid the hectic of everyday life. But Dublin. Oh, Dublin. What have you done to yourself in these fifteen short years since last we met? This entry was posted in Family, Photography, Travel and tagged Architecture, Books, Dublin, Family, Life, Photography, Politics, Travel by Simon Perks. Bookmark the permalink. I totally do themed vacation reading too. Sorry to hear yours was more of a downer than enhancer though! I have friends that just moved away from Dublin after living there for 3 years and they’re definitely happier in California. I had a great time when I went to visit though. It wasn’t so much the the city that was the problem, to be honest, but more the recognition that the country’s political leaders seem to have squandered so much promise, like a teenager who has come into an inheritance and splurged it on fast cars and new trainers, rather than saving for university or for the deposit on a house.